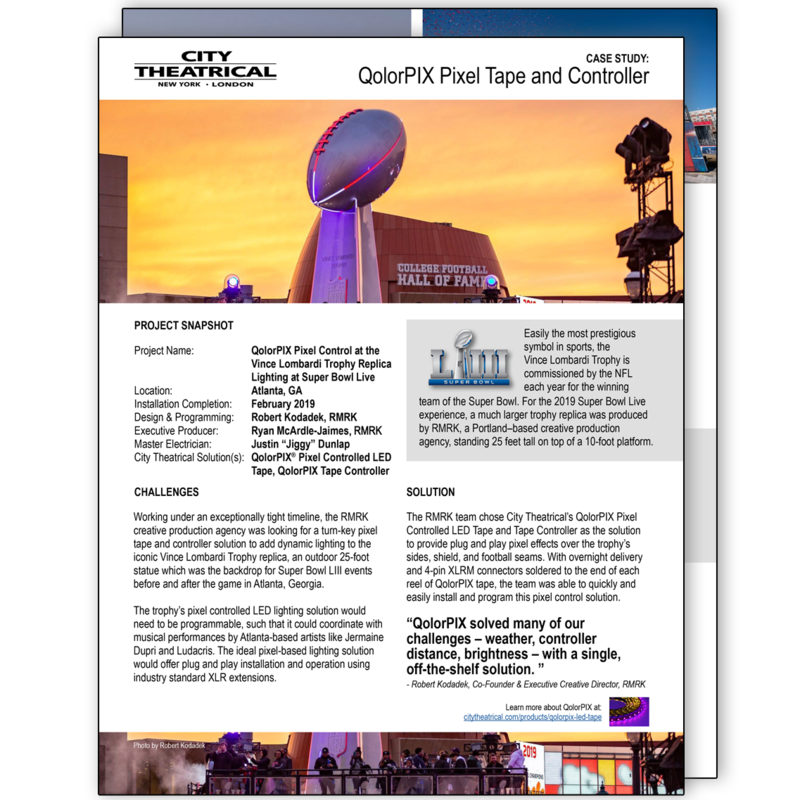 City Theatrical’s new QolorPIX Pixel Controlled LED Tape is a dynamic and distinctive addition to the QolorFLEX® line of LED Tape, dimmers, and accessories. QolorPIX Pixel Controlled LED Tape is designed for the most demanding professional applications, with 48 individually controlled LED lights per meter. Each reel of tape includes a soldered-on four-pin XLR connector on one end, creating a plug and play connection to the QolorPIX Tape Controller to create thousands of effects, including chases, fades, scrolls, bursts, and more. QolorPIX Pixel Controlled LED Tape runs on low voltage (5VDC) and is sold in five meter reels, with a maximum cable connection length (between controller and tape) of 10 meters. The tape is encased in clear rectangular silicone, making it water resistant (IP 67 rated) for indoor or outdoor use. Q1. How much tape is on each reel of QolorPIX Pixel Controlled LED Tape? Q2. What are the cutting increments of QolorPIX Pixel Controlled LED Tape? A2. You can cut the tape between each LED, or 21mm. Q3. What is the voltage of QolorPIX Pixel Controlled LED Tape? A3. QolorPIX tape operates at 5 volts. Q4. How many LEDs per meter are on QolorPIX Pixel Controlled LED Tape? How many LEDs per reel? A4. There are 48 LEDs per meter and 240 LEDs per reel. Q5. 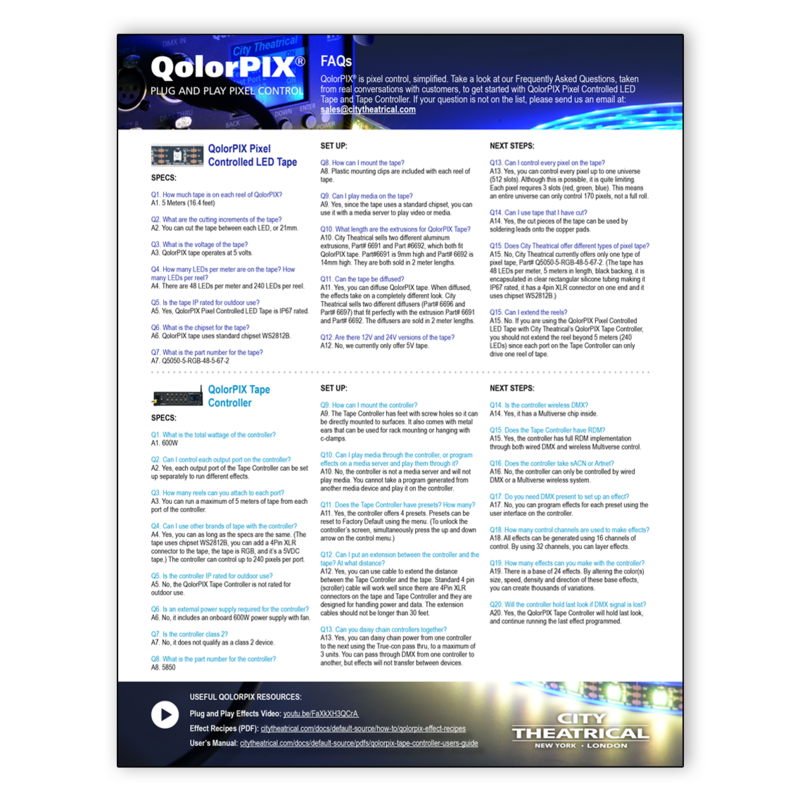 Is QolorPIX Pixel Controlled LED Tape IP rated for outdoor use? A5. 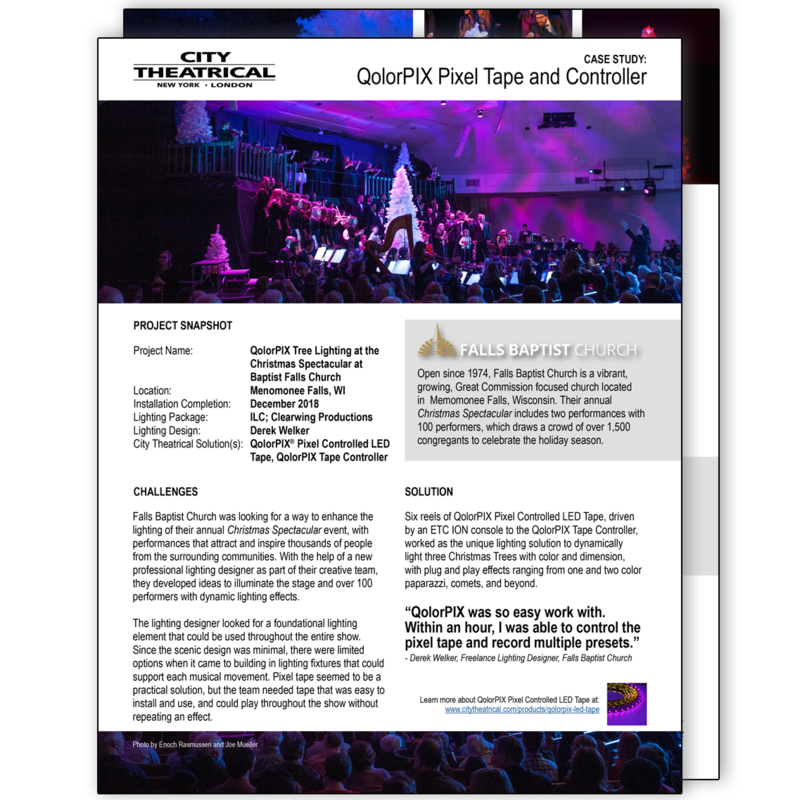 Yes, QolorPIX Pixel Controlled LED Tape is IP67 rated. Q6. What is the chipset for QolorPIX Pixel Controlled LED Tape? A6. QolorPIX tape uses standard chipset WS2812B. Q7. What is the part number for QolorPIX Pixel Controlled LED Tape? Q8. How can I mount QolorPIX Pixel Controlled LED Tape? A8. Plastic mounting clips are included with each reel of tape. Q9. Can I play media on QolorPIX Pixel Controlled LED Tape? A9. Yes, since the tape uses a standard chipset, you can use it with a media server to play video or media. Q10. What length are the extrusions for QolorPIX Pixel Controlled LED Tape? A10. City Theatrical sells two different aluminum extrusions, Part# 6691 and Part #6692, which both fit QolorPIX tape. Part#6691 is 9mm high and Part# 6692 is 14mm high. They are both sold in 2 meter lengths. Q11. Can QolorPIX Pixel Controlled LED Tape be diffused? A11. Yes, you can diffuse QolorPIX tape. When diffused, the effects take on a completely different look. City Theatrical sells two different diffusers (Part# 6696 and Part# 6697) that fit perfectly with the extrusion Part# 6691 and Part# 6692. The diffusers are sold in 2 meter lengths. Q12. Are there 12V and 24V versions of QolorPIX Pixel Controlled LED Tape? A12. No, we currently only offer 5V tape. Q13. Can I control every pixel on QolorPIX Pixel Controlled LED Tape? A13. Yes, you can control every pixel up to one universe (512 slots). Although this is possible, it is quite limiting. Each pixel requires 3 slots (red, green, blue). This means an entire universe can only control 170 pixels, not a full roll. Q14. Can I use QolorPIX Pixel Controlled LED Tape that I have cut? A14. Yes, the cut pieces of the tape can be used by soldering leads onto the copper pads. Q15. Does City Theatrical offer different types of pixel tape? Q16. Can I extend the reels of QolorPIX Pixel Controlled LED Tape? A16. No. If you are using the QolorPIX Pixel Controlled LED Tape with City Theatrical’s QolorPIX Tape Controller, you should not extend the reel beyond 5 meters (240 LEDs) since each port on the Tape Controller can only drive one reel of tape.